What about people who are using bicycles because they have mobility problems? There are a lot more people doing this than you think. Bicycles are much easier to move around than walking. And as the population ages and more people start getting arthritis, more people are going to choose cycling over walking as a way to get moving. Not to mention that families with children on bikes still exist and will still want to use protected bike lanes. This decision endangers them all. All for the convenience of one narrowly-defined segment of people with disabilities. I predict that it won't be long before someone sues the City for failing to maintain accessibility standards. The protected bike lane is part of public infrastructure and arguably this puts a duty on our government to make it safe and accessible to all users (not just the spandex wearering). For some background, Councillor Kristyn Wong-Tam got the ball rolling on this one reportedly. It started with a complaint at 24 Wellesley that someone could no longer drop someone off at the front door of their condo (even though there's access on two other sides of the building). Wong-Tam championed the removal of the protection of the bike lane in that section so that they (and anyone other schmuck) could now block the bike lane. But that wasn't enough, there had to be a comprehensive weakening of protected bike lanes. Wong-Tam reportedly requested staff to start this process and led the advisory committee where they did their consultation (although failing to consult the wider public). This led to the Public Works and Infrastructure Committee to accept the proposed "solution". To be extra clear, Toronto absolutely should make the city more accessible for everyone. But this isn't the solution. This endangers vulnerable road users, including families, elderly and people with disabilities who choose to bike. The City fails to address any of their concerns and likely puts themselves at legal risk by doing so. I was part of the effort to have these lanes installed while I lived in Ward 27 and I still use these lanes when I go downtown. 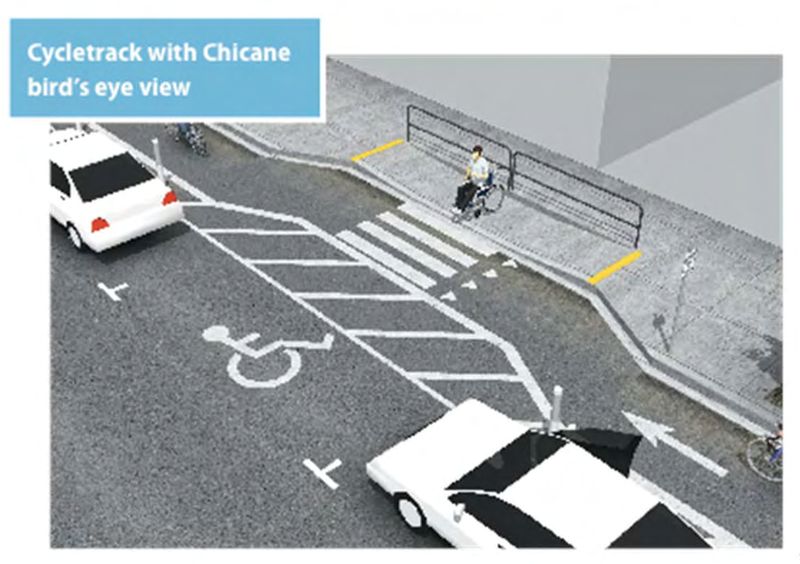 It is unbelievable to me that the city is proposing to allow parking in bike lanes! I'm not sure those supporting this proposal appreciate how seriously this would undermine bike lanes and put cyclist safety at risk. It has taken years of progress to even begin to instill into drivers that it is not OK to park in bike lanes. To allow some drivers to park in bike lanes would severely undermine this (finally) developing norm and would embolden all drivers to park in bike lanes, putting cyclists at a serious risk of injury because of the (now) false sense of security they will have. The report does not consider the sheer number of drivers who have Accessible Parking Permits (many of them improperly obtained or used) who will be able to take advantage of this exception. There is not even a requirement that the person being loaded or unloaded be disabled in a manner that requires direct curbside access. I see no evidence in the report that we must resort to this drastic measure of allowing drivers to park in bike lanes to accommodate those who are inconvenienced by their location. I fail to see why site-specific modifications can't continue to be made (or, God forbid, drivers be expected to stop in car traffic lanes) rather than undermining bike lanes and putting cyclist safety at risk. It is shocking that this proposal may be implemented on such short notice and without public consultation. I would request that this matter be deferred to so that more affected users might have a chance to consider this proposal and provide input or make deputations. This might also save the city from a great deal of embarrassment and public anger by blindsiding residents with such a drastic and ill-considered change. I urge the City to adopt a real solution here, much like that adopted elsewhere, that allows people unload without blocking the protected bike lane. The city of Toronto needs to be held responsible when putting people's lives in danger like this. If an accident happens the City and whoever is responsible for these types of backwards planning decisions should also be taken to court. This is unacceptable. Key every car that does this. Key every car that does this. Extensively!!!! The Caronto Councillors, even the alleged 'progressive' ones, still trend to be caraven, and at times advocates are adfauxcates. Like - where's the squawk about the Fail to remove on-street parking when there's a desire for a disabled access point? That's the Big issue really, though it's also a set of issues to have the weakening of the bike lanes, though I don't really mind sharing them with legitimately less-abld, (including the motorized scooters), and other human-powered vehicles, as part of road-sharing. With Ms. Wong Tam, it is quite ridiculous that the 24 Wellesley occurred, with that alley way right there. Ms. Wong Tam also weakened bike infrastructure at Bay/Davenport in creating a pinch point where there was a good southbound bike lane prior (though the Ave. Rd. to near-Bay is sub-standard/bad, especially the 'eastbound'); there's also a Fail at Bloor/Sherbourne with that green paint, and a FAIL to do that bit of Bloor St. E. between Sherbourne and Church with bike lanes, as per 2001 Bike Plan, and why isn't that part of the pilot??? (Though I'm OK with starting things off with cheap paint). An issue that should be recognized by advocates and adfauxcates is that our roads are kinda narrow relative to other cities/demands. Plus streetscar tracks to dictate lanes. So sure, it's nice to know that other fixes are possible, but even before the politics of suburban dumbination, is there adequate road allowance? ?